A diagnosis of pulmonary embolism is made when the embolus is seen as an area of low attenuation in a contrast-enhanced pulmonary artery . 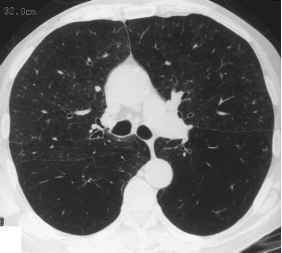 Acute pulmonary emboli may be manifested as partial or complete filling defects in vessels, by the ''railway track sign,'' or as mural defects. Figure 4 Acute PE. Complete filling defects are seen in the lateral and posterior basal segmental arteries, which appear distended. vessels of the same generation. This is in contrast to the smaller diameter seen with chronic thromboembolic disease . The ''railway track sign'' is the demonstration of a clot floating within the vessel (Fig. 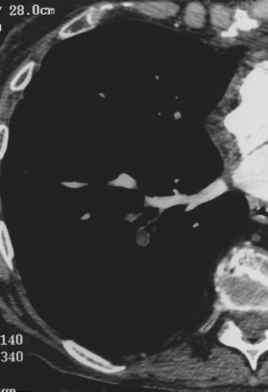 5), and a mural defect is defined as a clot that appears adherent to the wall of a vessel, with contrast not completely surrounding the clot. In acute thromboembolic disease, mural thrombi usually form acute angles with the vessel walls in vessels that are sufficiently large to examine for this finding (Fig. 6) . There should be a sharp interface between the filling defect of a pulmonary embolism and adjacent contrast, and the filling defect should be seen on more than one image. Looking for these findings should prevent the misdiag-nosis of minor mixing inhomogeneity or other artifacts as emboli. 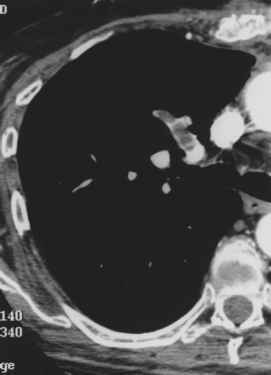 The failure to visualize a vessel should not lead to a diagnosis of pulmonary embolism. Figure 5 Acute PE. 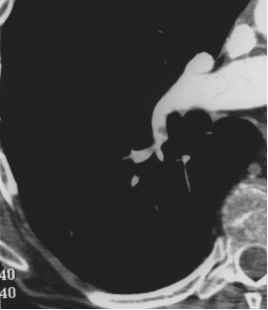 ''Railway track sign'' of clot floating in the anterior segmental RUL artery. Figure 6 Acute PE. Mural thrombus forming acute angles with the vessel wall in the superior segmental RLL artery.